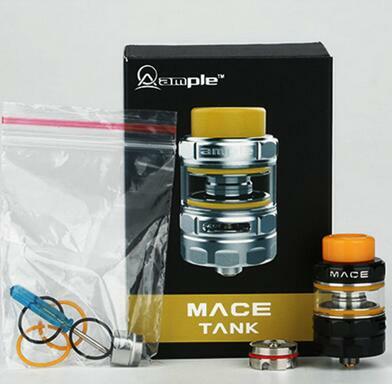 The Ample Mace Tank is a Sub-Ohm Atomizer with the new radial coil of AHC and ADC coils. These coils are made to have more area for heating cotton that will provide more vapor production and produce flavorful clouds. It has an included extra glass tube with 4.5ml, adding more capacity for e-liquids. What I really like about the Ample Mace Tank is the overall design, it has a very masculine look. The form of metal parts are not just there to add aesthetics but it has a good function of giving a good grip when disassembling the parts and adjusting the airflow. The color options are also great, you can choose from three 3 colors at Vapesourcing. At first look, I am not really sure if the new radial coil of Ample will provide a great vapor production. After a good look on this tank, the radial shape of coils will add more area for heating the cotton that will produce a good amount of vapors and adding a boost for flavor. The new radial coil of Ample Mace Tank is a unique and very functional coil, it will definitely provide a good vaping experience especially for Beginners who would like to experience Sub-Ohm performance with a pre-made coil.